Diaz, M.; Saez-Pons, J.; Heerink, M.; Angulo, C.
Emotional factors related to aging at home assistive technology are known to affect technology acceptance, effective use, and quality of life improvement. This paper is a survey on the affective dimension of robot-based systems conceived for helping elderly at home. The specificity of elders’capabilities (e.g. sensory and cognitive), coping styles, aspirations, lifestyles, social rules and preferences are facedwith available knowledge from the fields of social psychology, sociology and gerontology. In the case of social robots,convenient verbal and non-verbal communication and motion behavior (e.g. social distance, space formations) are to be designed according to generational and cultural rules. Moreover, robot behavior should be congruent with its role (i.e. helper, companion) and affordances. Emotional factors related to aging at home assistive technology are known to affect technology are known to affect technology acceptance effective use, and quality of life improvement. This paper is a survey on the affective dimension of robot-based systems conceived for helping elderly at home. the specificity of elders' capabilities (e.g. sensory and cognitive), coping styles, aspirations, lifestyles, social rules and preferences are faced with available knowledge from the fields of social psychology, sociology and gerontology. In the case of social robots, convenient verbal and non-verbal communication and motion behavior (e.g. social distance, space formations) are to be designed according to generational and cultural rules. Moreover, robot behavior should be congruent with its role (i.e. helper, companion) and affordances. Diaz, M. [et al.]. 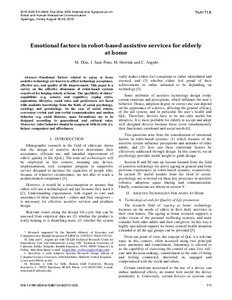 Emotional factors in robot-based assistive services for elderly at home. A: IEEE RO-MAN: The 22nd IEEE International Symposium on Robot and Human Interactive Communication. "Proceedings of the 22nd IEEE International Symposium on Robot and Human Communication (RO-MAN 2013)". Gyeongju: 2013.